In her«Garden of Love», Lara Kanso cultivates peace, love, wisdom, in a poetic and aesthetic environment, on a stage occupied by music and dance … poetic performance with Roger Assaf, music, dance and theater, «Garden of Love» is an invitation to travel within ourselves, within the Earth and towards Heaven. Inspired by the «Silk Tambourine» and «Song of the Birds», the performance develops the theme of the carnal and spiritual love, earthly and divine, alternating with sang and danced poems, and in the movement directed by the breath of Sufi poetry. 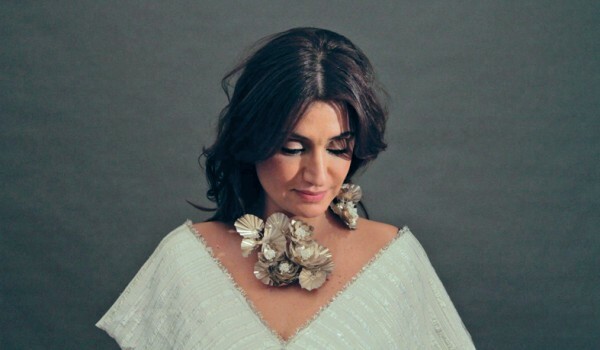 Today in this world drowning in violence and destruction, man needs Poetry and Love, the time of a cleverly concocted evening by Lara Kanso at Monnot Theater. Meeting. You wrote and staged the performance «Garden of Love». Would you talk about it?«Garden of Love» was born of a deep need to talk about something other than war and violence. It was during one of my Master Course in Theatre last year, that Mr. Roger Assaf told us about this Noh entitled «Silk Tambourine». I was fascinated by the story and I immediately felt that I would one day make it a play on stage. There is also everything that Japan and Japanese civilization inspire me. I have always favored authors and Japanese cinema. And then I discovered the Japanese theater: all is subtlety and finesse, even violence. «Garden of love» is a rewriting of Japanese Noh in an atmosphere rather Sufi. This is the story of a princess who asked about the universe and God; and a gardener who has never known desire before meeting the princess. Their encounter is going to change their destinies in a rather spiritual journey. The chorus of the tragedy consists of a contemporary dance dancer Kazumi Fuchigami, and a Sufi singer Daline Jabbour. The role of the princess is played by Sarah Warde and that of the Lady of the company and the Rawiya by Rosy Yazigi. The gardener is obviously Roger Assaf. Sufism mark most of your performances … It’s true. I think I inherited an Iranian blood on the side of my paternal grandmother who resonates very strong in me. I understand and love the Sufi language. I think it is kneaded with love and tenderness. It conveys good values ​​and a good opening on human beings, the universe and God. In Sufism, everyone has a chance and place. It is a philosophical current of Islam that I find bright. What is the role of the famous director, actor and screenwriter Roger Assaf? It is very difficult to talk about the role of Roger Assaf. At first, for me he is a great reference, a counselor, a Master. His opinion counts a lot and his presence too. His support and encouragement have greatly facilitated my work. He is also the gardener in the play. «Garden of Love» is inspired by a Japanese Noh and a Sufi poem. What is the relationship that you establish between these two genres? I felt the connection between these two worlds effortlessly. I was inspired by the great Sufi poem «The Song of the Birds» by Farid od-Din Attar. The journey of the birds in this beautiful poem crosses Seven Valleys: birds first pass through the Valley of Love to finally reach the valley of the Destitution, of Annihilation. «Garden of Love» includes seven steps and treats themes of love and annihilation in God or the divine light. What I have changed in the Noh is the character of the princess and the end of the tragedy. In Noh, Princess has no consistency; in «Garden of Love» is a character in itself. I also changed the end of the two characters: in Noh, the gardener commits suicide and the princess plunges into madness. In «Garden of Love», the two follow a rather spiritual evolution. A last message? There is no real message. «Garden of Love» is an artistic creation that speaks of the human being and the limits of the human condition. We identify with the characters, their questions, their quest. It is also an interesting work aesthetically: set design, video animation, costumes. It is a tender parenthesis in this world that became too crazy for me.